Online plant shop launches nationwide delivery for stylish, easy-care plant and pot sets. San Francisco, CA: It's true, you can buy a plant from Home Depot for $1. You can also buy some potting soil, a simple terra cotta pot, and cross your fingers when you get home that the plant will live through the week. That's not what Léon & George is here to do. This Silicon Valley startup is personalizing the process of buying and caring for houseplants for the modern city dweller. Unlike traditional nurseries or box stores, Léon & George offers an all-inclusive experience for consumers looking to add a touch of life and style to their space. Just in time for those summer vacation vibes, Léon & George is now offering nationwide delivery of their lush and vibrant greenery. 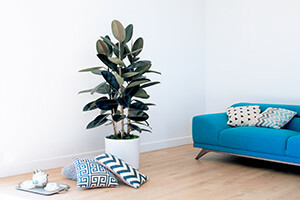 Houseplants have grown increasingly popular as millenials flock to cities, filling high-rise apartment buildings and smaller spaces, driving the desire for convenient ways to bring more of the outdoors in. The New York Times reports that "'millennials were responsible for 31 percent of houseplant sales in 2016,' according to Ian Baldwin, a business adviser for the gardening industry." With eager customers across the country and growing investor interest, Léon & George is well positioned for the bold new adventure nationwide expansion.